Shrimp & Grits. For most Southerners, this sounds like ambrosia. It’s almost a religion. For everyone else, an odd combination at best. “Grits (or hominy) were one of the first truly American foods. The Native Americans ate a mush made of softened corn or maize. In 1584, during their reconnaissance party of what is now Roanoke, North Carolina, Sir Walter Raleigh and his men met and dined with the local Indians. Having no language in common, the two groups quickly resorted to food and drink. One of Raleigh’s men, Arthur Barlowe, recorded notes on the foods of the Indians. He mad a special not of corn, which he found “very white, faire, and well tasted.” He also wrote about being served a boiled corn or hominy. Shrimp & Grits started off as a breakfast staple among the fisherman of South Carolina’s coastal low country during shrimp season (May – December). 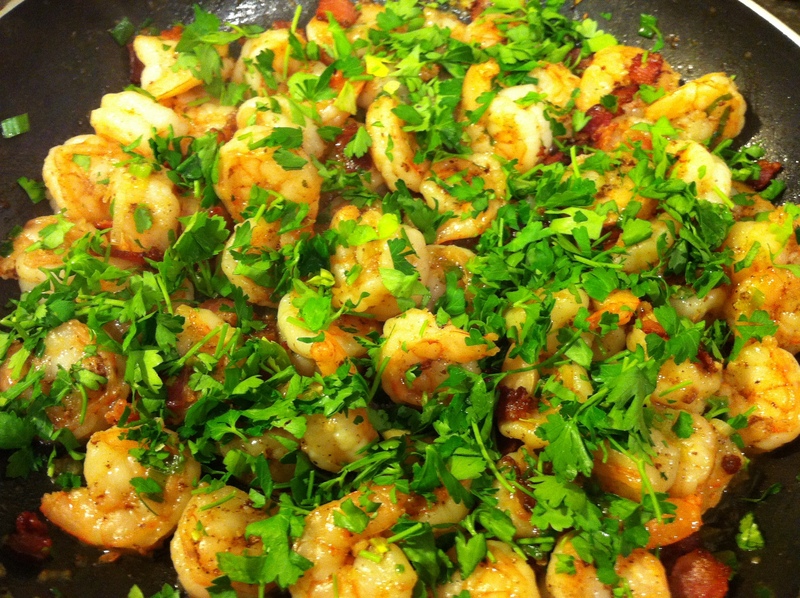 It was a simple dish called “breakfast shrimp” that was usually cooked in bacon grease or butter. In recent years, however, it’s been “fancified” and is now seen in restaurants all across the South and is eaten at any time of day. 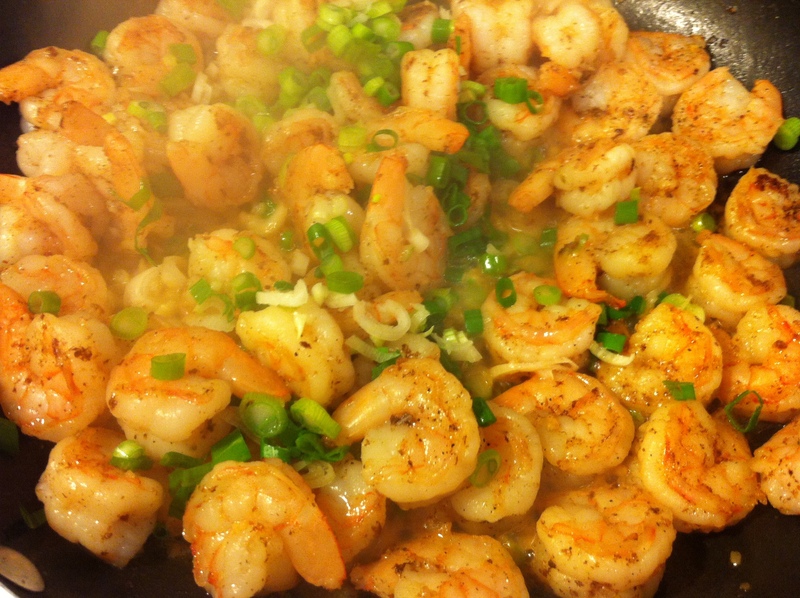 Now, admittedly, my recipe differs from traditional style Shrimp & Grits in that I use cornmeal, cheese, and parsley. It’s one of those “fancified” versions. 1. It’s important that you don’t use instant or quick-cooking grits. They don’t have the flavor or texture of slow cooked grits. 2. 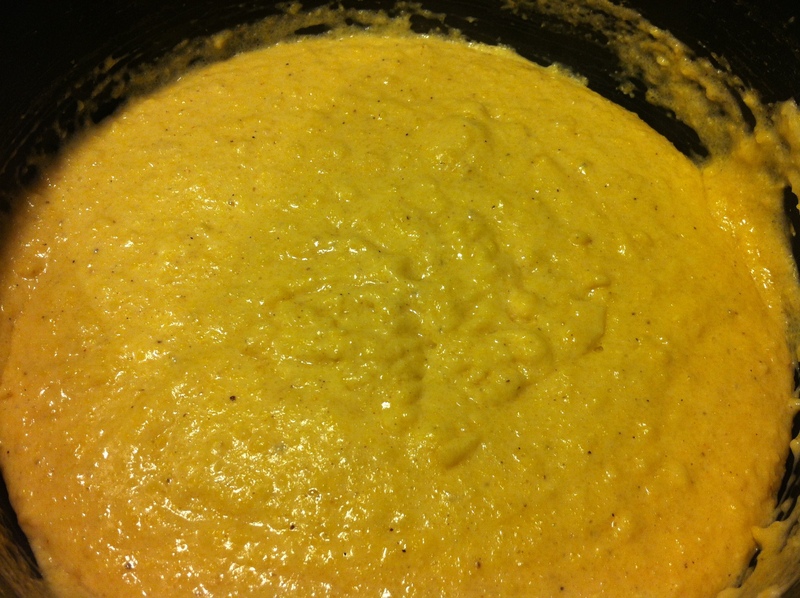 If you can’t find grits, then you can use stone-ground cornmeal. In fact, that’s what I use in this recipe. 3. For my readers who don’t eat pork, you can substitute turkey bacon. Just add 2 tablespoons oil or butter to the pan. 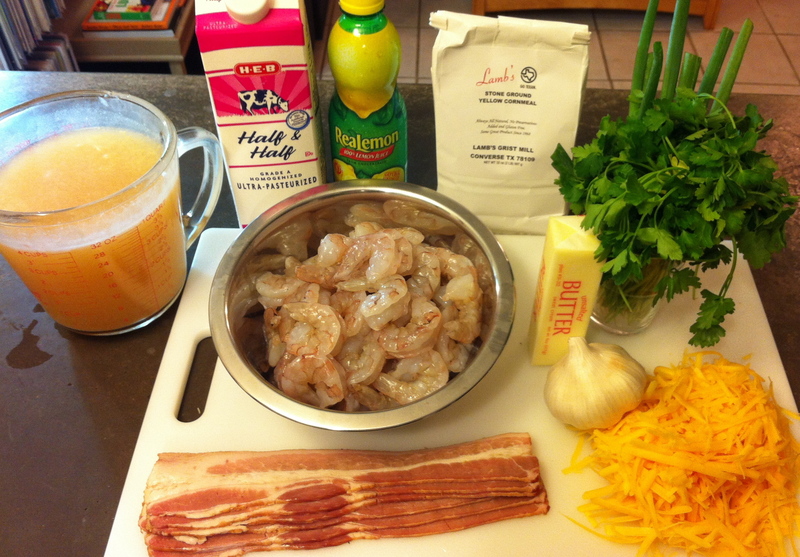 The bacon will flavor the oil or butter which in turn will flavor the shrimp. 4. 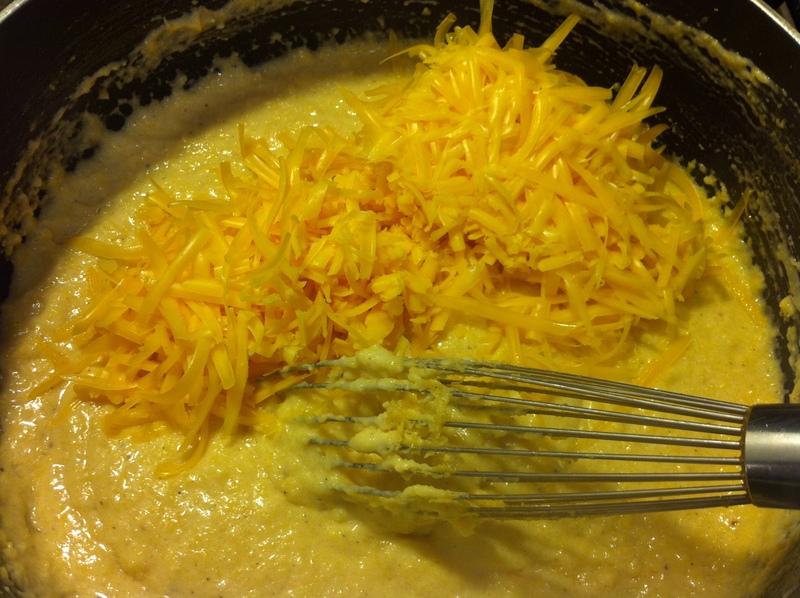 The cheese in the grits wouldn’t have been found in the earliest recipes. It’s a more modern addition. If you don’t want to add the cheese, feel free to omit it. 5. Use large or (insert oxymoron here) jumbo shrimp. They are just better in this recipe. 1. 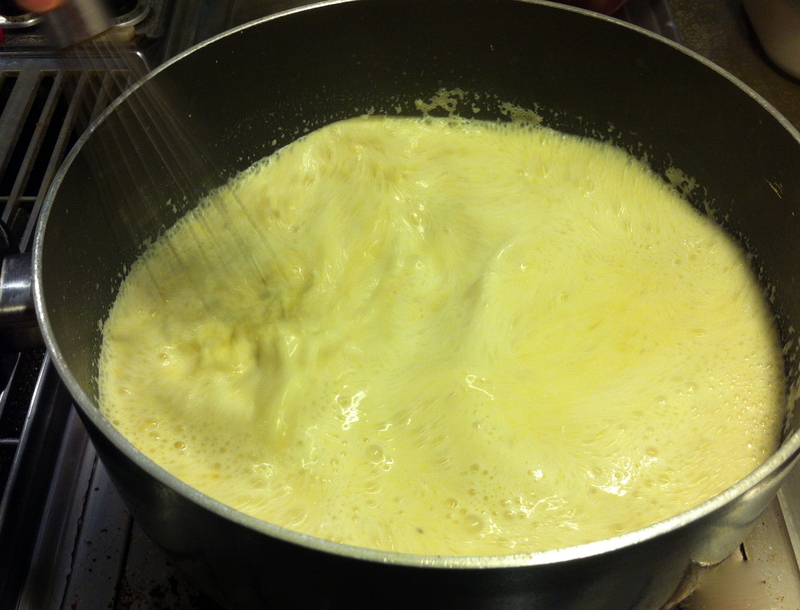 Make the grits: Bring the water or broth, and half & half to a boil. Add the salt and pepper. Whisk in the grits or cornmeal 1/2 cup at a time. It’s very important to keep whisking as you add the grits or cornmeal until they come back to the boil; otherwise, they’ll become lumpy and no amount of whisking will fix it. 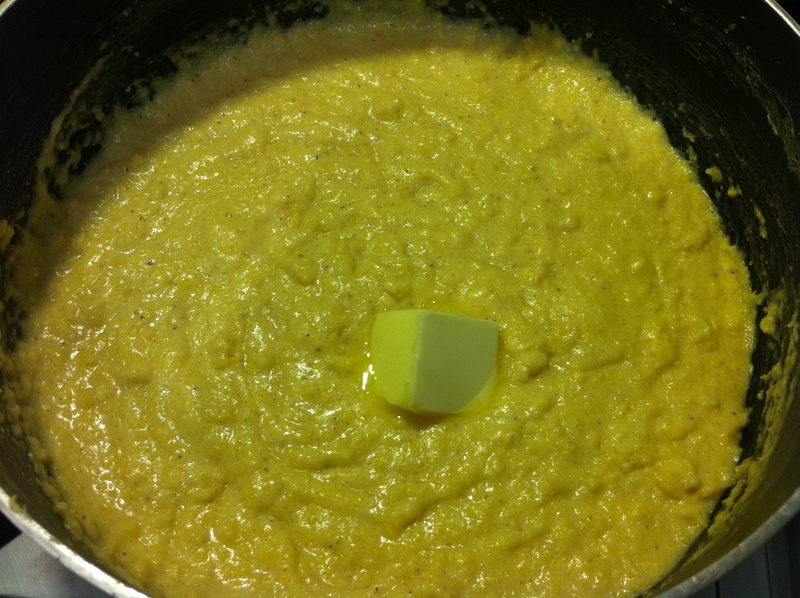 All the cornmeal in the pot and whisking until it comes back to a boil. When the all the grits are added and come back to a boil, lower the heat to low. (Be careful, there will be some splatter. This should calm down as you lower the heat and the mixture thickens.) Stir often. 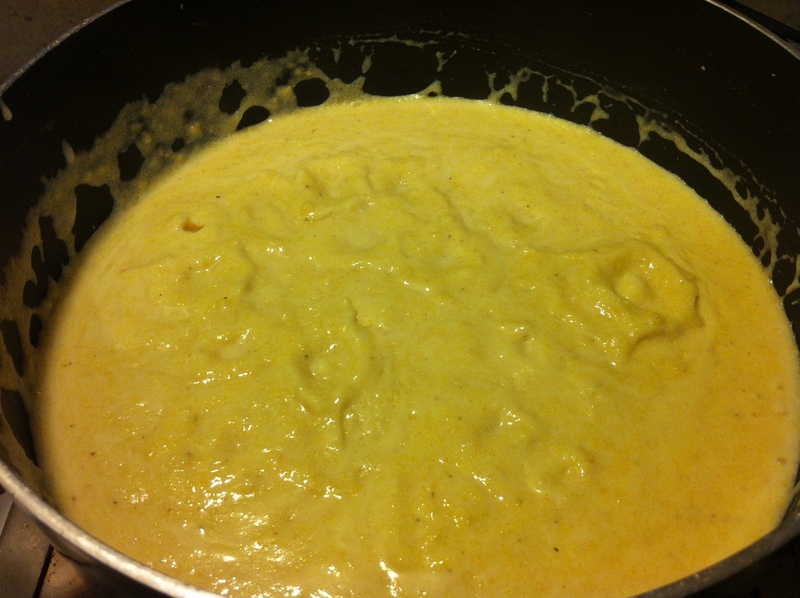 Continue cooking until all the liquid is absorbed and the mixture becomes very thick, about 20 – 25 minutes. Remove the grits from the heat. 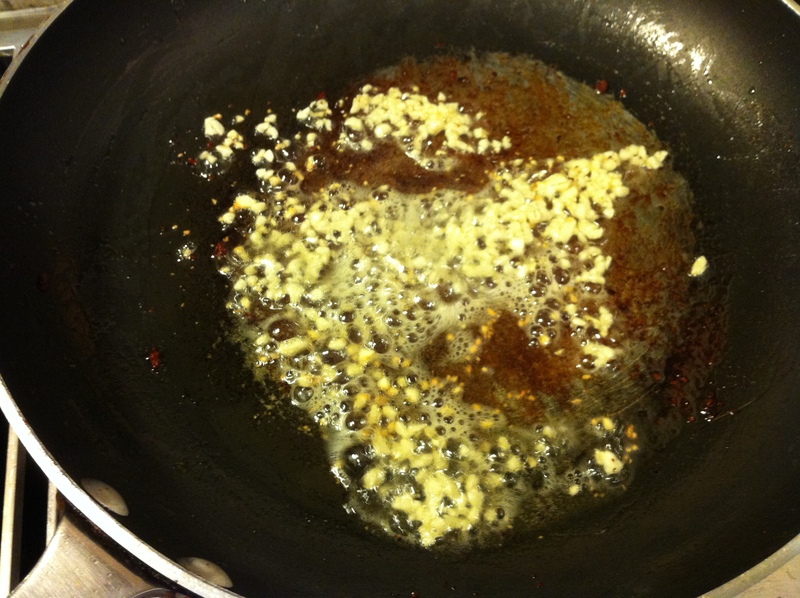 Stir in the butter and cheese. 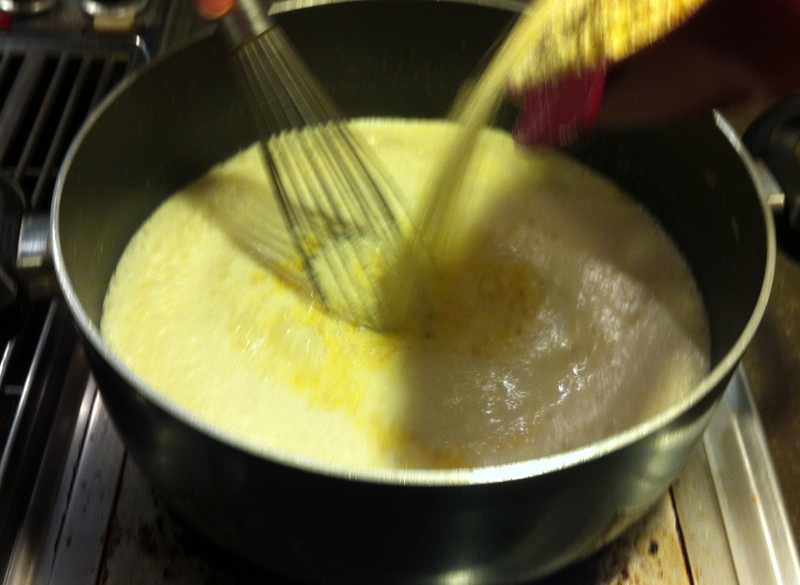 Once the butter and cheese have been mixed in, cover the saucepan and set the grits aside. 2. Heat a large skillet over medium heat. Add the bacon and cook until browned. 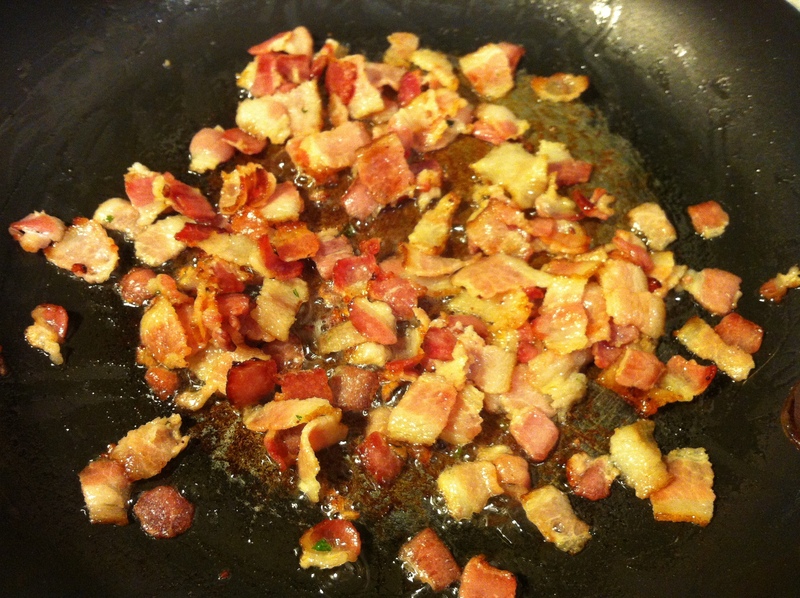 Once the bacon is cooked, remove it from the skillet with a slotted spoon and set aside. Increase the heat to medium-high and add the garlic. Cook for 1 – 2 minutes. Cooking the garlic. Be sure not to let it become too brown. 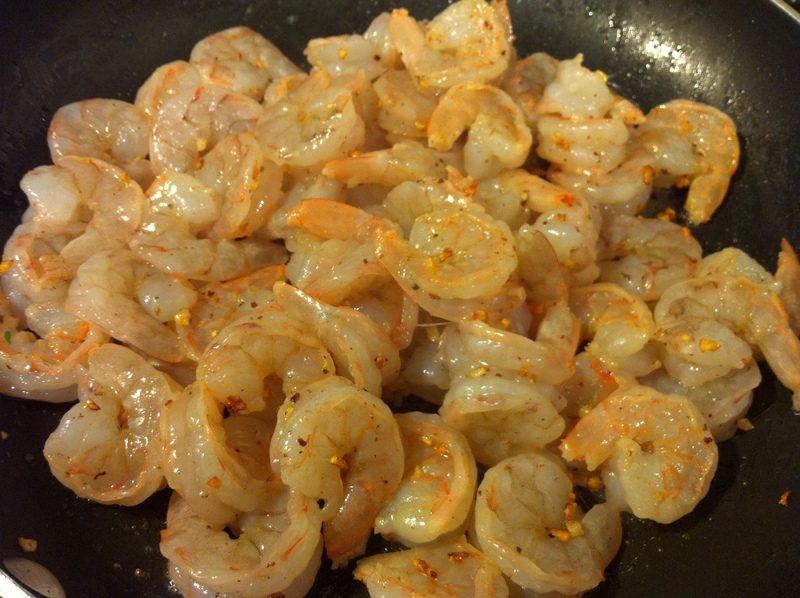 Add the shrimp and cook until they turn pink, about 5 minutes. Cooking the shrimp. You just want them to turn pink at this point. Add the scallions and cook another 1 – 2 minutes. Add the lemon juice and cook another minute. Take the skillet off the heat and stir in the parsley and reserved bacon. Adding the parsley and bacon. 3. 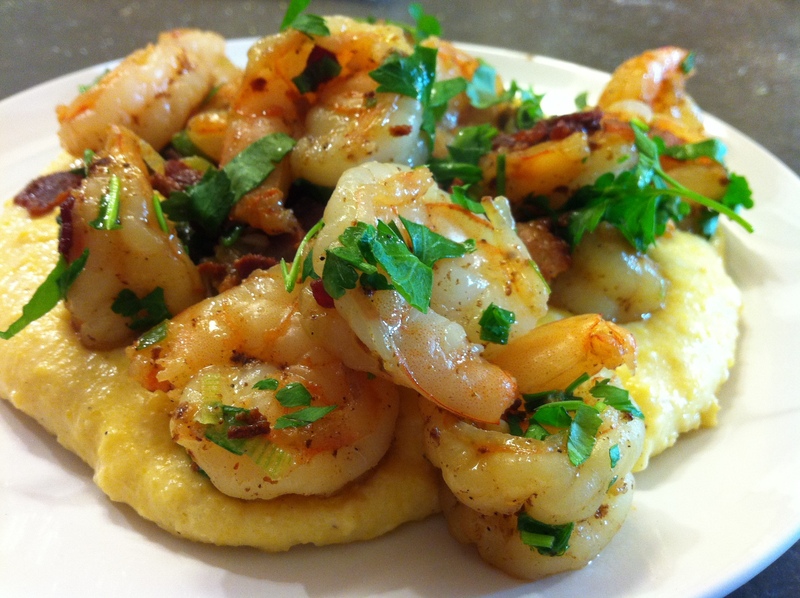 Serve the grits with a generous helping of the shrimp on top. p.s. One of the great things about leftover grits (regular or cornmeal) is when, when cooked properly, they solidify as they cool. While to the uninitiated, it sounds unappetizing, for a Southerner, it’s great. Take any leftover grits and put them into a small loaf pan or in a square or rectangular container and make as even as possible. The next day, take the “loaf” and cut it into pieces about 1/2-inch thick. Fry in oil or butter until browned on both sides (they will soften a bit). Take off the heat, and serve with some syrup or jam.